It was our second day on Réunion Island. I hadn’t seen much of the interior of the island since my arrival, just glimpses of towering mountains through the clouds. All that changed on the second day! We set out on a road trip from our base in Saint-Leu, along the coast to Saint-Pierre, to the Route du Volcan. The views of the Indian Ocean, lagoons and little towns dotting the coast were absolutely beautiful. Coastal scenery along the way. From Saint-Pierre, we turned inland along the RN3-road. The curvy road brought us to the town of Le Tampon (we had a few laughs about that!) 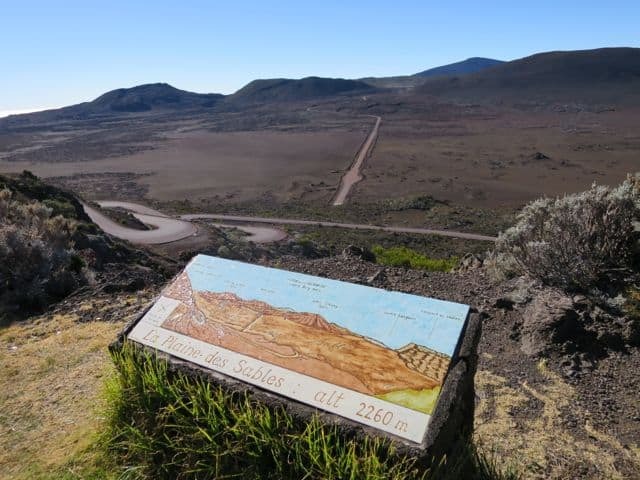 and from here, we continued to the Route du Volcan, the famed road that leads to the Piton de La Fournaise, one of the most active volcanoes in the world! The road was winding but the scenery around every bend was just spectacular! We passed green pastures and patches of pine trees, and were treated to breathtaking panoramas like this one around every bend! 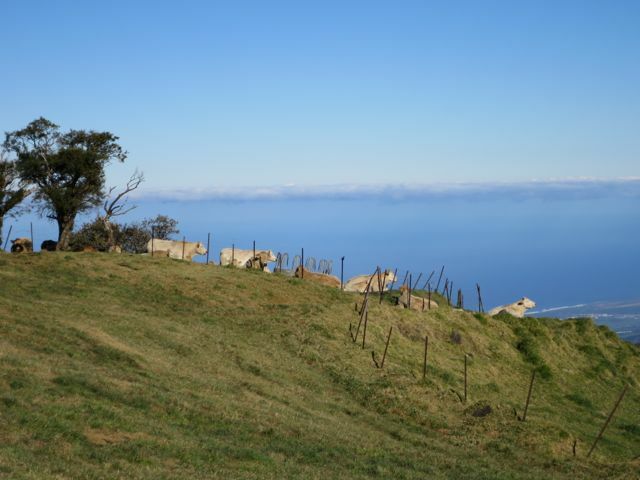 These cows have some of the most stunning views of the island! The views just kept getting more spectacular as we climbed higher and higher. We soon reached the edge of a massive canyon (Riviere des Ramparts) where we stopped for even more mind-blowing views. Below me, the walls of the canyon dropped about 1,000m! It was nothing short of breathtaking! We stood at the very edge of the canyon to get this amazing view! We continued silently along the Route du Volcan – I think everyone was just in awe of the astounding scenery – and at a certain point, Niko, our driver/guide told us to close our eyes. We closed our eyes and felt the van turn a corner. Niko then asked us to open our eyes and what greeted us was something so baffling, it took me a few moments to process the wondrous images engulfing my mind! Whereas the landscapes up till that point were lush and green, the scenes before me resembled something on Mars! This was the Plaine de Sables, a volcanic plateau that’s covered with ash and rocks from eruptions of the nearby Piton de la Fournaise. Gone were the trees and colourful shrubs. 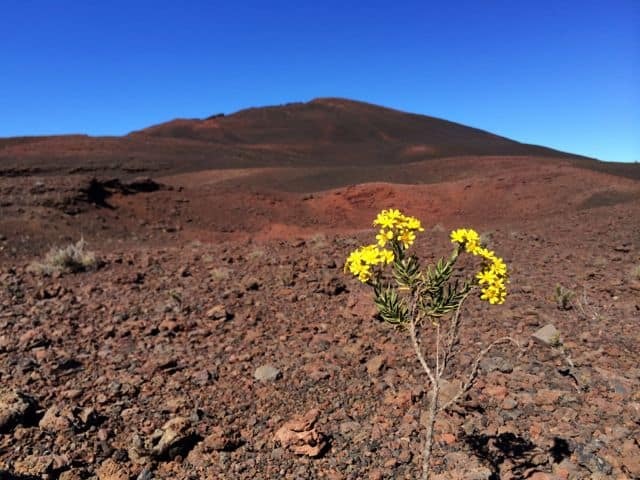 On the Plaine des Sables, there was nothing but reddish-brown dirt and rocks. A panoramic view of the Plaine des Sables. The walls of the Plaine des Sables. The road snaked its way down to the plateau floor where we had the opportunity to walk around – it really felt like we were on Mars! 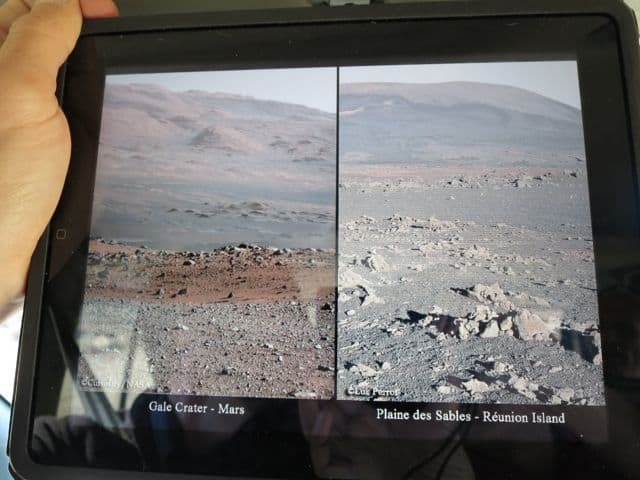 Niko pulled out his iPad and showed us two images: one of Mars and another of the Plaine des Sables. We agreed… they looked totally alike! Comparing the landscapes of Mars and Plaine des Sables. This was the opportunity of a lifetime to pretend I was on Mars! Haha! We did find some signs of life! 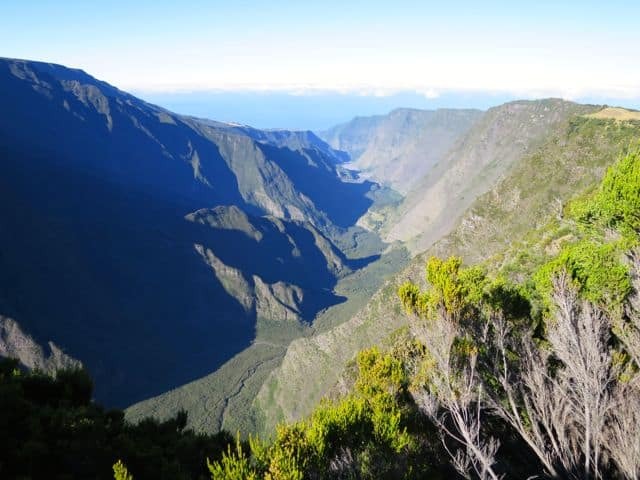 Read about things to do in Reunion Island. We continued along the dirt road, passing little craters and reddish mounds. I just couldn’t get my mind around how the scenery had changed so dramatically. It was so surreal. We soon arrived at the Pas de Bellecombe, the viewpoint at the edge of the Piton de la Fournaise (literally translated: Peak of the Furnace). Piton de la Fournaise is a shield volcano and is recognised as one of the most active volcanoes in the world along with Stromboli and Etna in Italy, and Kilauea in Hawaii. The viewpoint overlooks the huge caldera that’s 8kms wide. From here, there was a steep drop of several hundred meters to the crater floor. At the other end stood the imposing volcano. It was quiet now – the last eruption occurred just a week before – but we spotted the occasional puffs of smoke. I walked to the eastern edge of the viewpoint and noticed a thick blanket of clouds covering the eastern/ocean-facing flank of the volcano. It was a bewildering sight! The viewpoint is located on the edge of the caldera. 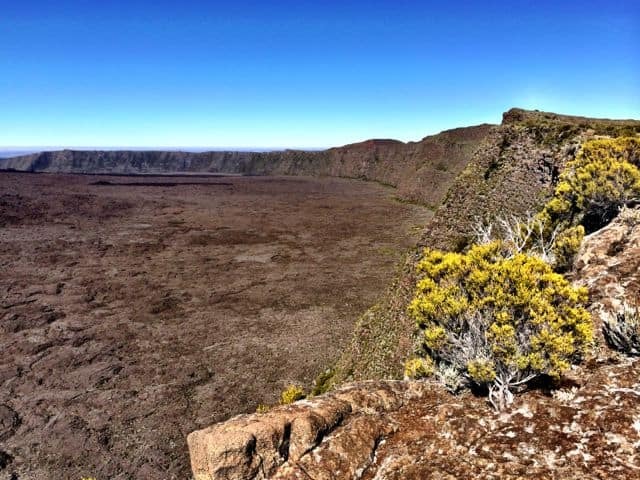 A panoramic view of the Piton de la Fournaise and its caldera. 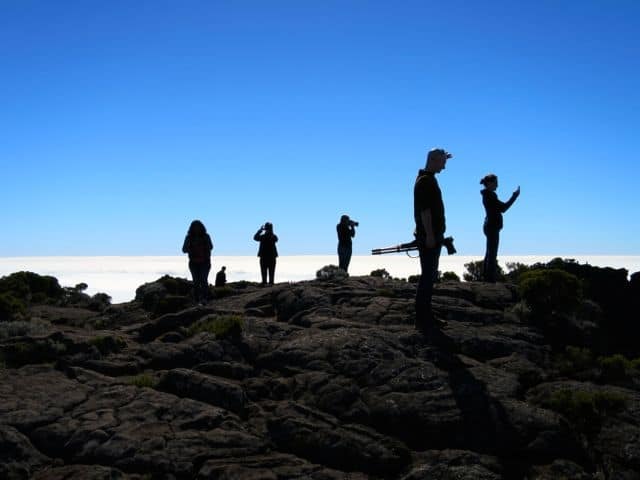 Standing atop ancient lava at the Piton de la Fournaise high above the clouds. 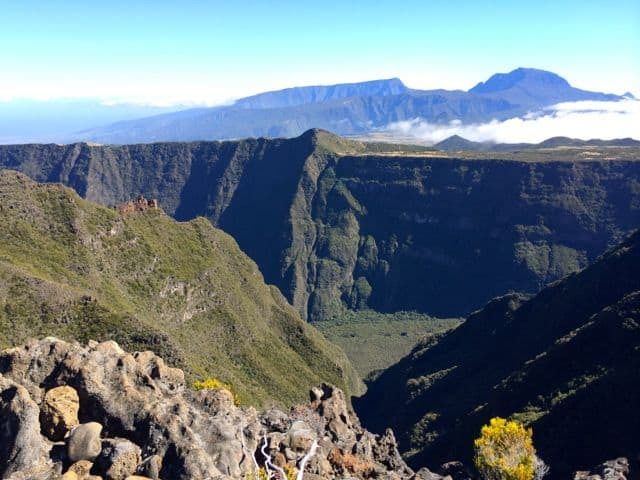 Driving the Route du Volcan is definitely something anyone visiting Réunion must do. The scenery along the Route du Volcan road trip is amazing and it provides a fantastic introduction to the island’s huge diversity of landscapes. 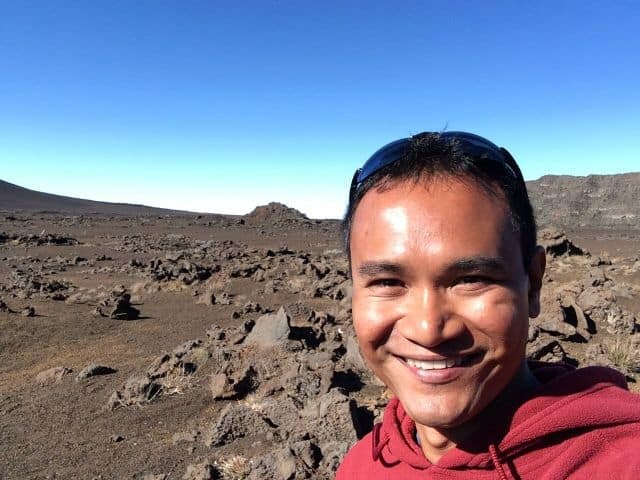 You can hire a car and explore the island on your own or you could get in touch with Niko (Nicholas) from Tours Reunion who would be more than happy to show you around his island. Réunion Island is located in the Indian Ocean, about 200km southwest of Mauritius. Réunion is an overseas department of France; French is the spoken language and Euro is the currency. Air Austral offers frequent connections from Paris, South Africa and Mauritius to Réunion. I flew with them from Paris and the service and food on board their modern Boeing 777 aircraft are superb. Read other Réunion Island posts on Velvet Escape. Note: the #GoToReunion campaign is a collaboration between iambassador, Réunion Tourism Board and Air Austral. As always, opinions expressed are mine, and mine only. What a dreamscape … never knew what sights the island of Reunion held until recently … thanks for the photos! Amazing views that seemingly go on FOREVER – Wow! Ha La Réunion! 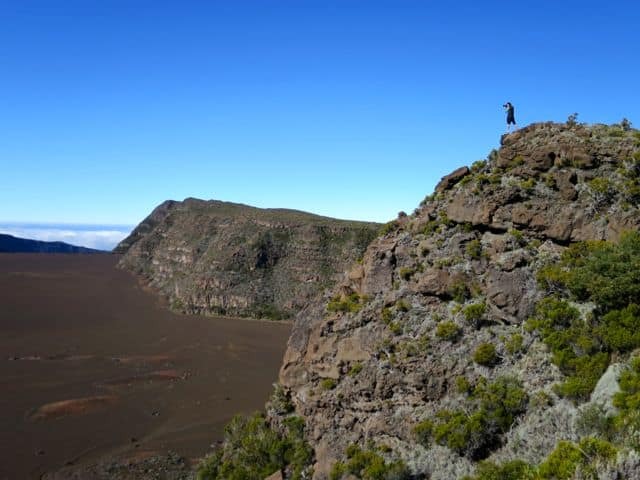 One of the best island worldwide, so many unexpected things and the famous… Piton de la Fournaise! Reunion has been on my wishlist for a few years, thanks for the report, it sounds amazing. And I love the you on Mars photo!